I Buy Way Too Many Records Dot Com: Heavy Times - Dancer 7"
I was very appreciative to get a copy of the new Heavy Times 7" sent to me for review. Another one of those cool instances where someone sends me a record by a band that I already like. If you've read past reviews, you've seen that I consider Heavy Times an unlikely favorit, but what I always am drawn towards is the pop song hidden beneath their fuzz. I can't possibly tell you what happened to Heavy Times on this 7". They sound like a completely different band and not in a good way at all. The 7" starts out with "Dancer," a bummer of a song that's further marred by unnecessary synth and a silly monotone vocal delivery. What happened to the fuzz? What happened to the frantic guitar and the recorded in a cave howling? Next up is "Midnight Highway" which sounds more like the Minibosses meets Warm Soda. Again, not in a good way. It's sterile in all the wrong ways and at the root of things it's just not a song that I think is particularly great. The B side is better, but not a lot better. "Coptic Rot" is at least a little dirty and noisy, but again there's nothing catchy or deceptively catchy about the song. It's kind of repetitious and plodding, not really going anywhere. The best song on the record is the last one, "Edge of the Night." But even being the best of this bunch isn't much. It's still an unnaturally slow song and the vocals are, again, totally monotone and lacking any kind of urgency. It's got a decently catchy lead guitar part worked through, but it would still probably be the low point on any other Heavy Times release. As I said at the beginning, I have no idea what happened to these guys. Maybe up too late at night watching Tron before this was recorded? Hopefully this is a one time excursion for the band getting some weird songs out of their system, but if Heavy Times comes around with a new full length, I'm going to have to check out a few songs before I bling buy it. 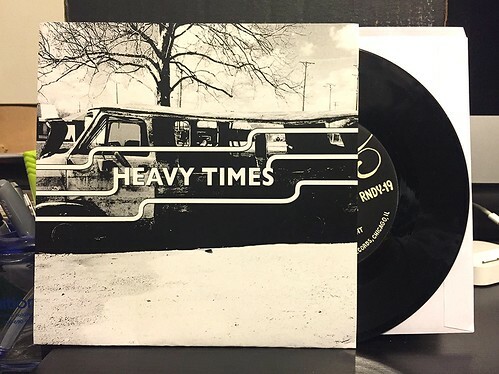 As a longtime HEAVY TIMES-fan I'm not disappointed at all. At this 7" and the "Black Sunglasses"-7" on Hozac they go for a postpunk-foundation, but their trademark guitar harmonies and songwriting skills are still there. The production is a bit dry, but fits way better with the music as on the Hozac-7" before. I personally like their shift from that fuzzy pop punk-sound to this darker realms - it feels like a naturally progression for them.